Bali Dynasty Resort is a fantastic Bali Hotel, centrally located within walking distance to the nightlife and excitement of the central Kuta area. This Bali accommodation offers a wide range of room types to suit families and couples. The kids can enjoy the kids club while the adults spoil themselves at Ashoka Spa or the Beach Club. For a memorable and relaxing stay in Kuta why not stay at Bali Dynasty Resort. Bali Dynasty Resort caters well for couples and families, with a wide range of facilities to enjoy including swimming pools, a day spa, an array of dining venues, kids & teens clubs plus much more. Choose from a range of modern, spacious and comfortable room types at this Bali accommodation. Bali Dynasty Resort is centrally located in Kuta making it a great place to base your next Bali holiday. Bali Dynasty Resort boasts the perfect location for a relaxing and memorable Bali holiday. This Bali accommodation is set within an easy walking distance to restaurants, shops, art markets as well as Waterbom Park and Kuta Beach. Select from a range of room types suited to couple or families and with plenty of onsite facilities to enjoy including 3 swimming pools, kids water fun zone, kids club, day spa and much more, Bali Dynasty Resort is the perfect Bali holiday choice. Bali on Sale for those last minute 2018 bookings. Book now to enjoy great savings. 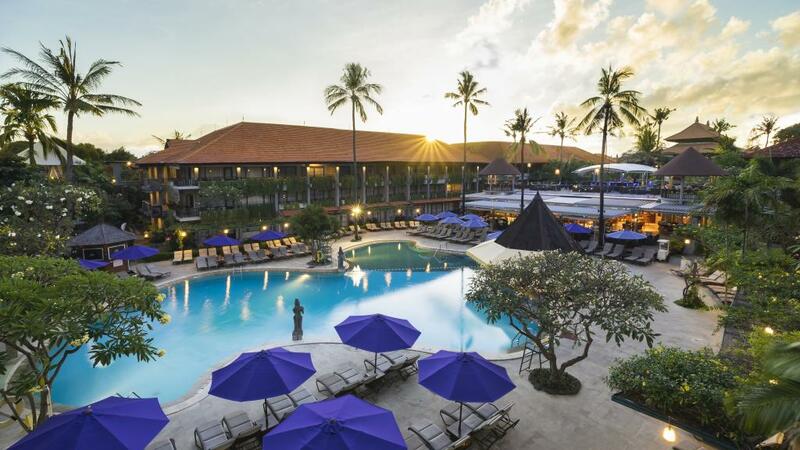 Bali Dynasty Resort is a fantastic Bali Hotel, centrally located within walking distance to the nightlife and excitement of the central Kuta area. This Bali accommodation offers a wide range of room types to suit families and couples. The kids can enjoy the kids club while the adults spoil themselves at Ashoka Spa or the Beach Club. For a memorable and relaxing stay in Kuta why not stay at Bali Dynasty Resort.